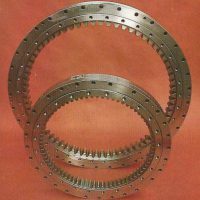 Axial bearings of large diameter are rotary devices with rolling resistance, suitable for accepting every combination of load with axial and radial force while simultaneously operating of the torque and transverse torque. They are used as cradles of construction, transport and other machines, plants and devices, i.e. wherever the upgrade is attached to a stable stand, with great static and dynamic load forces and moments.